Clear quartz is the most versatile of gemstones for metaphysical work. It has the unique property of being “programmable”, meaning you can infuse it with your intention and then it will amplify it, working on your behalf to manifest it in the world. It also acts to amplify the energies of any other stone you are working with. 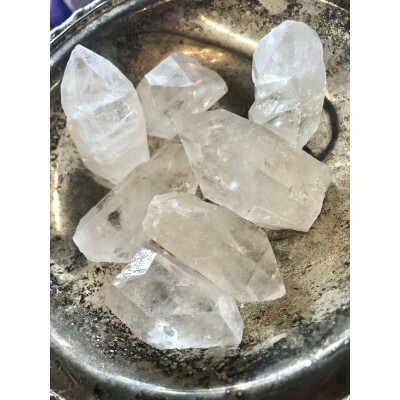 Clear quartz rocks have been appreciated for their lovely, reflective gemstone qualities, clear quartz healing properties and protective properties since ancient times. Clear quartz stones have been, and still are, believed to be actual living things that take a breath only once each century. Quite a few cultures throughout time believed transparent quartz crystals were an incarnation of The Divine. Clear quartz healing properties are extremely beneficial in spiritual healing. Clear quartz stones enhance personal awareness and growth. Clear quartz stones act as beacons of light and energy for highly spiritual people, in keeping with clear quartz meaning. Clear quartz powers benefit everyday thoughts and feelings as well as actions and words.